Avocados: Packed With Fat, But Without the Guilt! When many people imagine the perfect sandwich, they think of a greasy, fatty sandwich. Images of cheeseburgers, Philly cheesesteaks or a sandwich piled high with meat, cheese and maybe some bacon, dance through their heads. Those might sound tasty to some of you, but you have to admit that they aren’t very healthy. Now, I’ve heard a lot of people say that fat is where the taste is at. They insist that they need fat in their sandwich, in order for it to taste good. Well, if fat is what you truly need, I’ve got the perfect thing for you! Have a nice, creamy slice of avocado. It makes a very nice addition to many sandwiches. Not exactly. 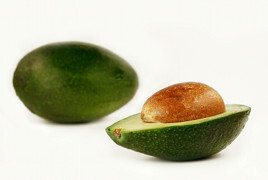 An avocado is treated like a vegetable when it is eaten, but it is actually a fruit. Avocados are cultivated from the avocado tree and are grown in tropical and subtropical climates around the world. But they are also grown in more temperate climates such as California, where 90% of the fresh avocados consumed in the United States are grown. Some of you are asking what happened to the fat I was offering because when most of us think of fruits and vegetables we tend to think of them as being low in fat and calories. For the most part, that’s true. But, avocados are an exception to that rule. Why should I eat avocados? An avocado contains almost 400 calories with approximately 75% of those coming from fat. Despite that, they are still very good for you. That is because the majority of the fat they contain comes from monounsaturated fats, which may actually help to lower your cholesterol. If you are worried about your fat and calorie intake, you can try eating the avocado varieties grown in Florida, if you can find them. They tend to contain about half the fat of the varieties grown in California. Despite the high amount of fat found in avocados, they are also nutritional powerhouses. Did you know that an avocado has 60% more potassium than a banana? Avocados are also rich in dietary fiber, B vitamins, folate, vitamin K and contain a good amount of iron and vitamin C.
How should I eat an avocado? In dips: Avocado is very common in dips. Guacamole, which is a very popular Mexican dip, uses avocado. You could also try adding some avocado to a hummus dip. In sandwiches: Avocados are great in sandwiches. Try an avocado and cucumber sandwich or an avocado and turkey sandwich. You’ll be blown away by how good they taste. In sushi: Next time you have sushi, try some with avocado. Many popular rolls use avocado, such as California rolls and Avocado rolls. In salads: Try adding some chunks of avocado to your salad. It will compliment your salad very well. So, unlike a Philly Cheesesteak, avocados are worth eating despite their high fat and calorie content because they have so many health benefits to offer. And they have less calories and fat than a salad with 2 tablespoons of ranch dressing or a cup of potato salad made with mayonnaise. Just don’t get carried away with how much of them you eat. They are high in fat and calories, after all. So, if you are going to eat something fatty, choose a fat that will be healthier for your body! Excellent post!!! In fact, I had an Avocado roll last night (so good). I have even made a raw dessert using avocado. Avocados are worth every once of fat! Mix with a little low fat mayo or cream cheese and add chopped cilantro for a delicious sandwich spread. They are also a nice addition to chicken salad and as a garnish on enchiladas. Yummy! Well, I don’t eat that much avocados but it is nice on a salad. I didn’t think about putting it in a sandwich but it sounds good! Thanks for justifying this. I have tended to avoid avocados since I found I had high cholesterol 25 years ago. This year’s fruit here in Florida are really nice, too. I see they are lower fat, Got some from farmer’s market this week. Will be getting more thanks to you. What is calorie count for 1 medium? Thanks for the post Talli. I almost forgot how good avocados are. They’ll definitely give you that glow. I love avocadoes. The nutritional consultant I work with always suggests them for people wanting to manage their weight. People don’t always realize the importance of the right kind of fats. Great article! I have been reading in several blogs about how wonderful avocados are. I’ve been eating them since I was put in solid foods! I’m in my mid 30’s and my mom used to mash them up with soy sauce or a little salt. Despite how much I’ve gained or lost weight I’ve never had high blood pressure, high cholesterol or a serious weight problem (and I’m a chef so I like to eat!) I’m surprised at how many things I’ve read where people act like avocados just came on the scene. How bizarre!